Spirogyra is one of the commonest and large genus with about 300 species growing as free-floating masses in stagnant or slowly moving waters (streams). 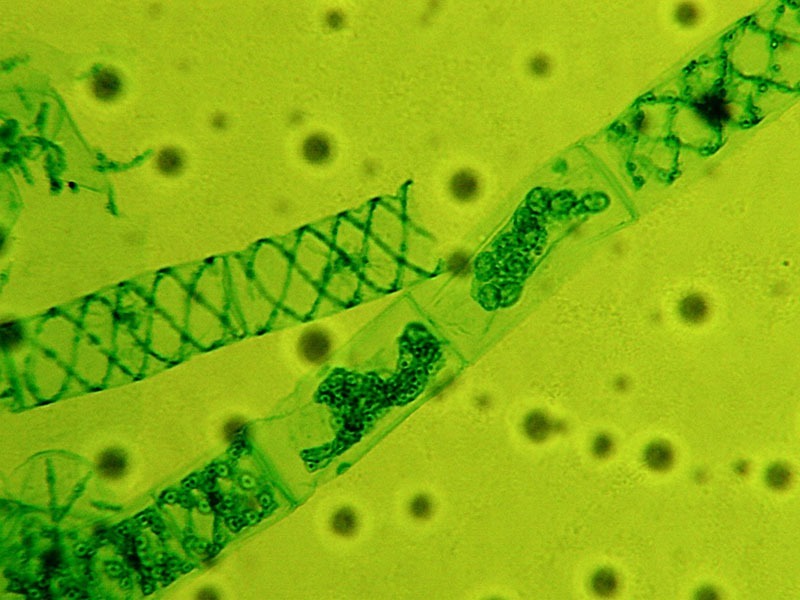 Some species, e. g., Spirogyra adnata are attached to the substratum through a basal rhizoidal cell. The masses of plants are slimy to touch because the filaments are surrounded by pectic sheaths which when come in contact water forms mucilage, therefore it is known as water-silk or pond-scum. The spirogyra grows abundantly in spring. 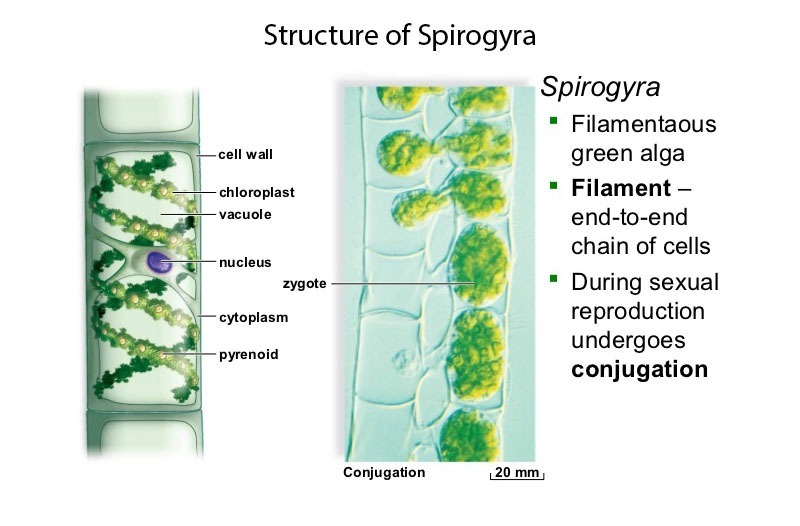 Spirogyra is unbranched with cylindrical cells connected end to end in long green Filaments. The individual cell is cylindrical, much longer than broad. In free-floating species, there is no distinction between the basal and distal ends, whereas in attached forms the lowermost cell develops a rhizoidal outgrowth called holdfast which helps in attachment. Each has a well-developed cell wall. The cell wall has two layers the outer wall is composed of cellulose while the inner wall is of pectin. The cytoplasm forms a thin lining between the cell wall and the large vacuole. Electron microscope studies show that mitochondria, endoplasmic reticulum, dictyosomes and other cytoplasmic inclusions are also present in the cell. The chromosomes vary from species to species from 5-24. Each cell has a prominent nucleus in the center, suspended by the thin strands of cytoplasm from the inner part of the cell wall. Chloroplasts are embedded in the peripheral Cytoplasm and their numbers are variable (as few as one). 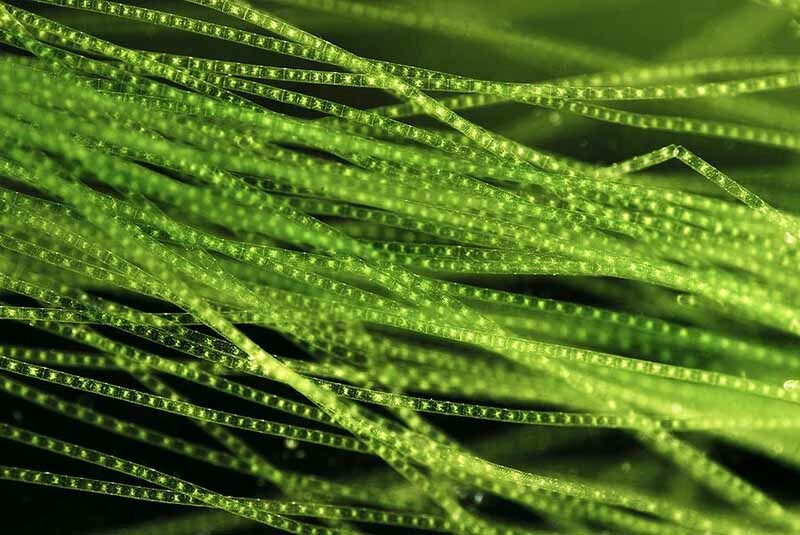 The chloroplasts are ribbon shaped and spirally resulting in the prominent and characteristic green spiral on each filament chloroplast contains several pyrenoids, appearing as small round bodies. The characteristic pigments are chlorophyll a, b, c, and d, carotene and xanthophyll’s. The growth of filament can take place by cell division of any cell of the filament except the holdfast. The reproduction in Spirogyra is vegetative and sexual mostly. However, some species exhibit asexual reproduction. 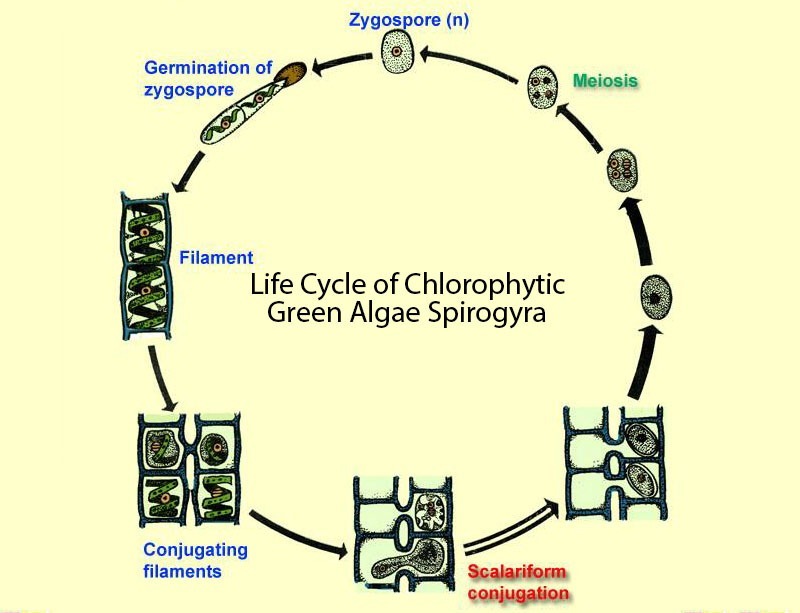 In asexual reproduction, fragmentation takes place, and Spirogyra undergoes Intercalary Mitosis to form new filaments. 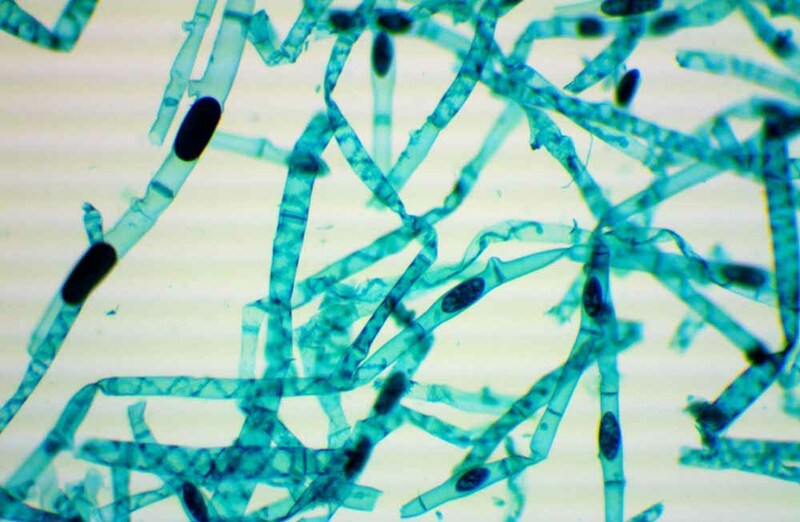 There are no asexual spores in the species. The sexual reproduction occurs when the conditions are unfavorable for growth. It is primitive type of isogamous sexual reproduction called conjugation. During the process two filaments come near each other and become glued together by their mucilage. Papillate (finger-like) outgrowths arise from the lateral walls of the cells. These papillae meet and their common walls dissolve to form a tube-like Structure, the conjugation tube. The protoplast in each cell rounds off due to loss of water to form a gamete. The gametes are isogametes; however, one gamete is active and move from one filament to the other. It is called male gamete. The other gamete is passive and remains in the cell. It is called female gamete. Therefore, Spirogyra exhibit physiological anisogamy. All the gametes in a conjugating filament may be either male or female. The male gametes move towards the female gamete through conjugation tube. The protoplast and nuclei of both the gametes unite to form a diploid zygote which secretes a thick wall to become a zygospore. After a period of rest the zygospore germinates into a new filament by cell division, Low nitrogen supply and high light intensity usually stimulate sexual reproduction. Scalariform Conjugation: It is the most common type of conjugation and occurs between opposite cells of the neighboring filaments as described above. Lateral Conjugation: In lateral conjugation, gametes are formed in a single filament. Two adjoining cells near the common transverse wall give out protuberances known as conjugation tubes, which further form the conjugation canal upon contact. The male cytoplasm migrates through the conjugation canal, fusing with the female. The rest of the process proceeds as in scalariform conjugation. The zygospore wall is 3-layered. The outermost layer is cuticularized whereas the innermost is thin and cellulosic. It is spherical or ellipsoidal and diploid. The zygospore becomes red in color due to disintegration of chloroplast, accumulation of oil and development of haematochrome. The zygospore is liberated by the decay of the wall of the female gametangium. It settles down to the bottom of the water and undergoes a long period of rest. At the return of favorable conditions, the zygospore germinates. The nucleus of the zygospore divides meiotically into four haploid nuclei. Three of these degenerates and the fourth one remains functional. The two outer layers burst and the innermost thin layer protrudes out in the form of a germ tube. This tube elongates and divides transversely into a colorless cell which functions as rhizoidal cell and attaches the germ tube to some support, and an upper green cell. The upper cell divides repeatedly to produce an adult filament which detaches itself from the support and floats freely in water. Upon closure look the spirogyra is a spiral like helix structure looks like an DNA.